ResMed’s AirFit™ N10 compact nasal mask is part of ResMed’s new AirFit range —the right fit for you. Its excellent performance, combined with optimal usability, raises the standard in the compact nasal category. The AirFit N10 is simple and intuitive for patients to fit and comfortable to wear, with an under-eye frame providing a clear line of sight. The AirFit™ N10 raises the bar for compact nasal masks, delivering effortless performance, comfort and visual freedom, in a user-friendly design that weighs just 2.9 ounces. Self-aligning EasyClick clips secure the frame to the headgear easily. Plus it has a simple key-clip cushion and a durable yet highly flexible integrated short tube. The soft cushion, SoftEdge™ headgear and optional soft sleeves all contribute to patient satisfaction. And diffused venting helps create a comfortable environment. With a compact design and a sleek frame that’s positioned underneath the eyes, the AirFit N10 provides patients with unrestricted vision. 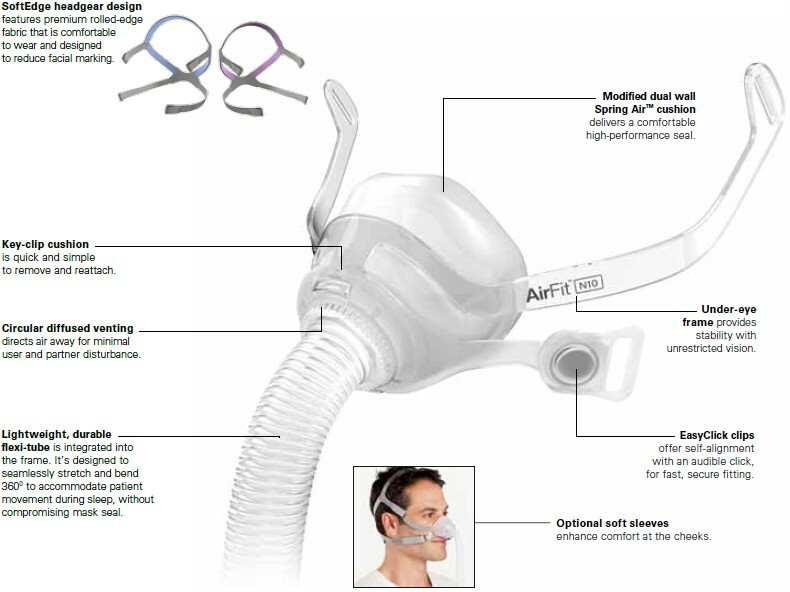 There’s a reason the AirFit N10 ranked as the overall first choice by patients when compared to industry-leading nasal masks. It delivers effortless performance, comfort and visual freedom, in a user-friendly design. 1 When compared to industry-leading nasal masks. ResMed internal studies D632-105 August 2013 and D632-124 November 2013. My hubby has used this nasal mask for awhile and it always his backup. old reliable. I have tried many masks and of all, I like the N10 best. I like that the small flexible hose comes into your cushion, not a hard part that rotates. I also like the ease of putting it on with the magnetic holders. As always service was great!! I wish I had known about this mask sooner. Love it.